When Chanel's digital theme 'downloaded' the old technology world onto a modern runway. We must admit, we purposely took our sweet time writing about Chanel’s runway show that took place at Beaux-Arts interiors of Paris’ Grand Palais. Instead, we spent the week debating whether we should be basking in the excitement surrounding Lagerfeld’s data centre that was complete with rows of computer hardware and colourful wires, or if we should be disappointed in Chanel’s misrepresentation of the merge, easily interpreted as more gimmicky than realistic. 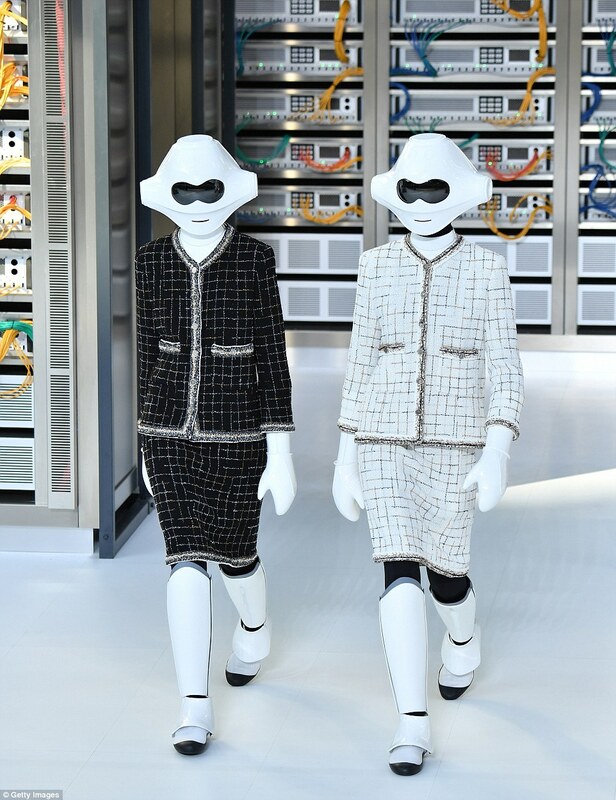 It was with the words “the next step will be artificial intelligence and robots”, that Karl Lagerfeld formally presented ‘Intimate Technology’, Chanel’s RTW Spring/Summer 2017. Gimmicky or not, the 83 year old saluted all things digital with a collection that was less about the merge of fashion technology and more, according to Lagerfeld, about “putting the soul in the machine.” The show opened up with Star Wars warriors walking out to Donna Summer’s I Feel Love wearing reconceptualisation version of Chanel’s classic tweed. Grabbing our attention, and keeping it, the robotic models gave us flashbacks of the kind of technology prominent in the movies of yesterday rather the innovative technology of today. When it comes to the overall collection, the looks that the models strutted down the runway in gave us glimpses of 90s swagger, ath-leisure and vintage Chanel. The show stoppers came in the shape of colour burst patterns of electric shades and neon radiance, pixelated tweed created with nylon threads and vinyl stripes, and LED display bags that bragged animated customised messages. As for our take on the luxury label’s ceremonious dabble into technology, well, we would definitely describe the whole show as paying homage to more retro tech than tech of the future. It was a debacle that proved that the merge of fashion and technology is becoming increasingly unavoidable, even to an old school label like Chanel. The truth of the matter is, we are entering a new era of fashion, an era that has been given the nod of approval from fashion’s very own Godfather, Mr Lagerfeld, and honestly, if Chanel cannot kick start this movement into second gear, then I don’t know what will!